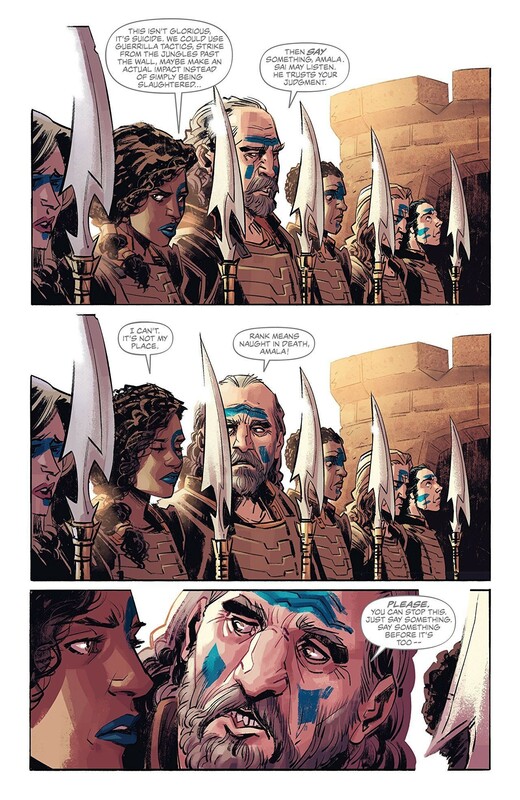 When the debut issue of Self/Made opens, infantry warrior Amala Citali and the undernourished army of Arcadia, streaked in blue face paint, confront an overwhelmingly powerful foe—Teronak, a villain who reconstitutes himself every 1,000 years to wreak havoc with the aid of barbed, red tentacles flowing from his torso. 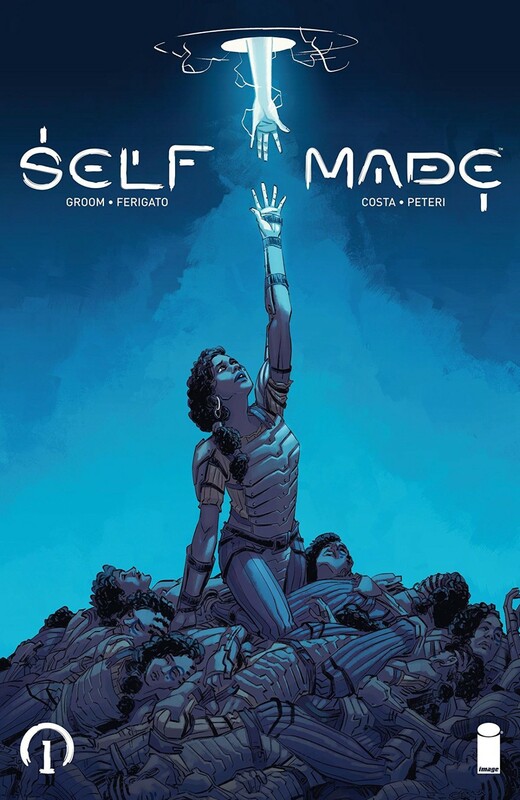 But Self/Made isn’t a series content to revisit familiar storylines; Amala’s quest will take her far from home after an unexpected encounter with her creator. The resulting tale from writer Mat Groom and artist Eduardo Ferigato twists and pivots in unexpected directions, playing with classic fantasy staples before folding in science-fiction flavors with a healthy dose of existential philosophy. This ambitious storytelling makes Self/Made a difficult narrative to easily summarize, especially without giving away the mind-melt surprises that punctuate its first issue. Those worlds veer from besieged, stone-walled cities to curving temples clustered in desert wastes, as well as a jade-colored chamber (evocatively rendered by colorist Marcelo Costa). But the most interesting facets of Self/Made don’t necessarily occur in the panels; Ferigato and Costa string their gutters with plot-specific jolts of electricity, signifying developments that will become more tangible as the series progresses. The cross-genre nature of Self/Made positions the title in an intriguing, postmodern sphere within the world of comics. As Groom notes, “Amala is someone stripped of her purpose and wandering far from home in search of a new path.” He cites both East of West and Saga as touchstones that straddle high concepts with deep emotions. For the more mysterious and philosophical elements of the book, Groom pulled from unexpected film sources: the Pixar staple, Toy Story, featuring a collection of inanimate objects achieving self-realization, and Michael Mann’s cabbie-hijacking thriller, Collateral. “I certainly wouldn’t point readers towards them as a tonal or visual reference for our series, but they’re both stories about two wildly different people (or toys, I guess, in the case of Toy Story) who have a chance encounter—and the unexpected relationship that develops between them totally changes the course of their respective destinies,” Groom explains. That relationship invites urgent real-world concerns of misogyny and class struggle into a world one step removed from our own. 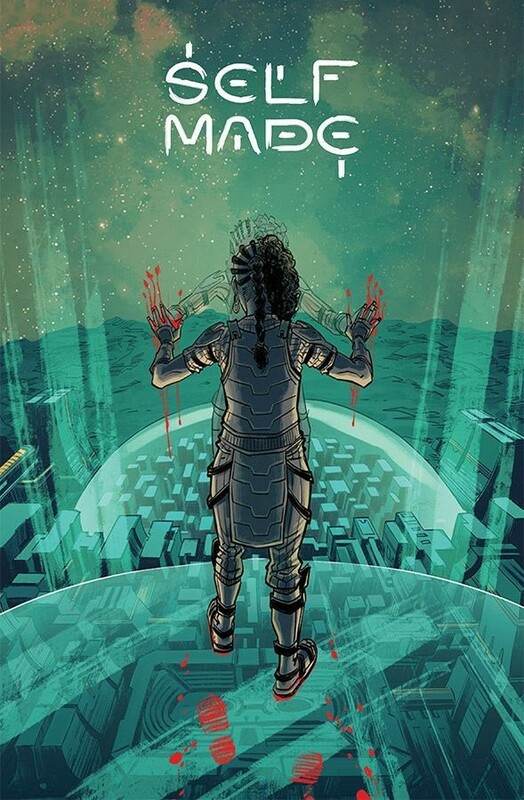 Self/Made adeptly explores one character’s journey through a tiered cosmos while venturing into questions of justice and injustice. It’s a book unafraid to grapple with big ideas, even as it balances them with visceral thrills. The result is an innovative dive into the annals of genre fiction buoyed by expressive art and svelte characterization. Self/Made #1 is available now.